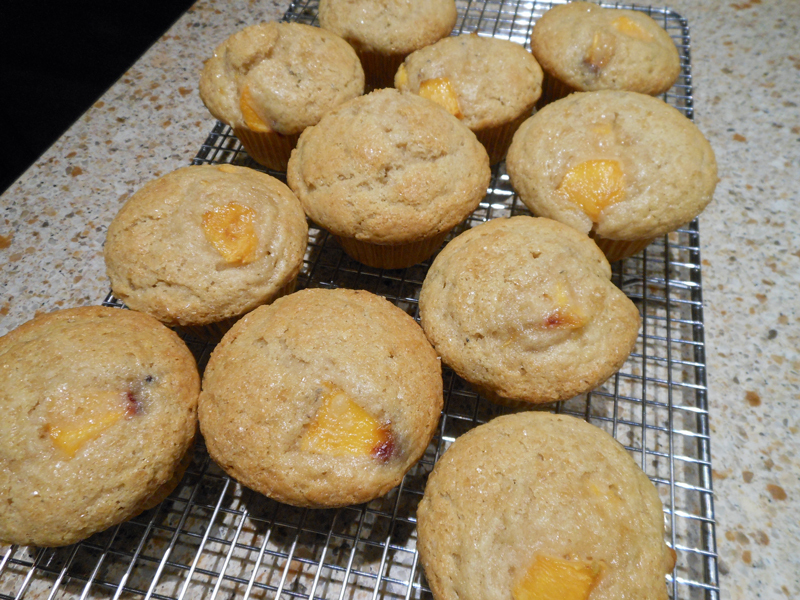 When peaches are in season, buy up on them and freeze them (see note on freezing them). You can bake these delicious muffins any time of the year. Position rack in lower third of the oven and preheat oven to 350 degrees. Lightly spray 12 muffin cups with vegetable oil spray or line with paper liners. In a large mixing bowl, whisk together flour, baking powder, baking soda, salt, cinnamon and sugar. In another bowl, whisk together buttermilk, oil, egg, and vanilla. Pour wet ingredients over dry ingredients and mix just until combined. Gently fold in the peaches, using as few strokes as possible, be careful not to overmix. With a large ice cream scoop or spoon, scoop batter into the prepared muffin cups. Sprinkle tops with turbinado sugar. Bake for 25 to 30 minutes, until muffins are golden brown. The tops should be firm to the touch and a toothpick inserted in center of muffin should come out clean. Remove from oven and let cool for 10 minutes.